My only complaint is the holster was rated as "Medium autos with 3-4 inch barrels". However my XDS compact with 3.3 barrel didn't fit in the holster so I got a different one. Will this holster be to large for a .25 cal. Raven semi auto ? I would try the smallest size to fit that gun, "Small and Medium Double Action Revolvers (2" to 3" bbl)". Select "Medium Autos (3" to 4" bbl)" as your fit. The straps that attach and hold the holster are they Velcro ends? Strap Traps cover both thumb break and retention strap Velcro so straps cannot be accidentally stripped away and lost. 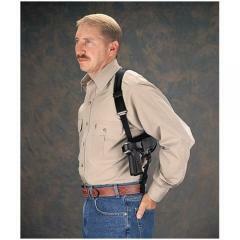 Will this shoulder holster fits the XD Springfield 40 subcompact? Yes, select "Medium Autos (3" to 4" bbl)". I am 6' tall and weigh 275 lbs and have a 50" chest, XXL. Will this holster fit me? Yes, the shoulder holster will fit 50" chest.